Today Stellar Four joins Reddit, Wikipedia, BoingBoing and countless other websites in protest of two key pieces of legislation currently being considered in a committee markup hearing by the House of Representatives in February and voted upon by the Senate on January 24; Stop Online Piracy Act (SOPA) and Protect Intellectual Property Act (PIPA) respectively. The two bills would crack down on illegal distribution of copyrighted material on the internet and are supported by major lobbying groups including the Motion Picture Association of America, Time-Warner and the Country Music Association. 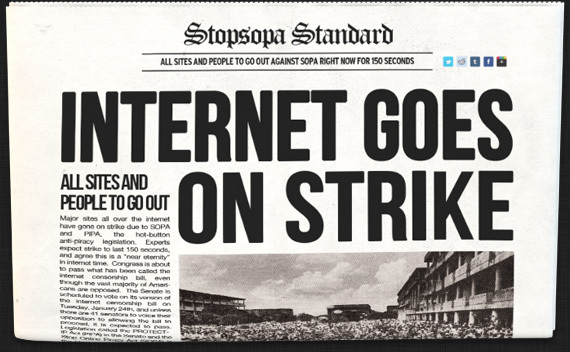 Because it is difficult to prevent organizations in foreign countries from providing illegally obtained and distributed content to American consumers, SOPA and PIPA would cut off access to the content by shutting down domestic websites that furnish or link to it. It would also mean search engines like Google would be unable to link to such sites, payment processors like PayPal would be prevented from delivering monies, social networking sites like Facebook would be forced to prevent users from linking to providers, and blogs like Stellar Four would be unable to embed unauthorized videos or just link to any such copyright infringing material providing you the latest information about new programs, videos and movies. If we did, we would cease to exist. These bills threaten our freedom of speech, one of the tenets America was built on. Stellar Four supports intellectual property rights but the two bills before the houses of Congress go too far. We will be going dark and not providing any new content beginning 12 AM Eastern on January 18 and ending 12 AM Pacific on January 19, 2012. If you agree, please contact your Members of Congress and urge them to prevent the passage of SOPA and PIPA. -Megan S., Sara N., Meghan B., and Laurie K.